One of the most obvious changes on the taskbar since Windows XP is the increased size of the icons and with them, the whole bar. In Windows 7, the whole name identifier was left for the sake of thumbnail previews and slightly bigger icons. However there is a simple option making it possible to reverse the taskbar style back to XP days. To accomplish this, right-click the taskbar and select Properties. On the appearing window, check the Use small icons checkbox (third from above on the Taskbar tab). 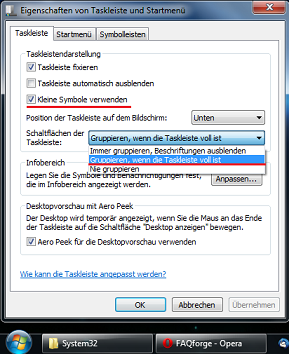 In addition, go for the combining-dropdown-menu and select one of the other remaining options, either to combine when the taskbar is full or to never combine.